Before I had children, I would obsess about a theoretical future daughter and the critical information I simply had to impart to her. Epiphanies would strike -- Fair Witness! She'll need to know how to be a fair witness! -- and I'd pull the car over, write my revelation down, and then daydream about compiling a D'Artagnan-Rosenberg infostream manifesto to hand to that girl, once she appeared and when she was ready. Lucky me, I got my daughter -- and a spare (and a handsome son as well). I never put together that manifesto, but also no longer fret about it: Andi Buchanan and Miriam Peskowitz let me off the hook two years ago, when they published their own compendium of core girl knowledge, The Daring Book for Girls. 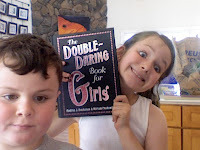 Lucky us, they've now published a second collection: The Double Daring Book for Girls. Honestly, I want to hand this book to every girl I know, and the boys as well (pink typeface and Girl label be damned, this book is a powder keg of information and ideas for any kid). I am pleased that it contains overlaps with that imagined manifesto of mine, e.g., batik techniques and history (p.99), commonly confused words like imply and infer (p. 141), and the specifics of quality private eye work (p. 177). What I truly appreciate, and what makes the Daring books transcend the How To label, is the activities' historical and often rebellious context. Why should our kids want to know how to waltz (p. 78)? How about because it was considered scandalous -- the dancing partners touched! And vulgar, forbidden -- it was easy to learn and didn't require a dance master! Mostly, I am dazzled by the amount of good, hard, enticingly written information amassed in this book. I want kids to know everything in it. I want them to know exactly who Eleanor of Aquitaine was, and how startling her long, accomplished, independent life was compared to most women of her era. I want them to know the fundamentals of rhetoric, how to make a raft, the story of Ada Lovelace, how to join the circus, how to say thank you in scores of languages, how to make snowglobes, how to conduct an orchestra, and how to make rope ladders. One quibble: The entry on Running a Magazine (p. 204) never mentions the word "zine," or how those handmade magazines helped drive the relatively recent Riot Grrrls feminist movement, which is perplexing, but I suppose in keeping with the book's overall timeless and classic feel. Don't let this one item keep you away. The Double Daring Book for Girls is buoyed by positivity, and focuses on cultivating competence, independence, willingness to experiment, and open-ended fun. It provides multiple short biographies of women whose lives exemplified these attitudes. These role models and this book are antidotes for heavily-marketed (and in some cases marketing-originated) books like the one pictured below, the title of which I will not type here, which my daughter and her friends crave, and in which junior high-aged girls live lives of insecurity, negativity, and cruelty, while obsessing about label-spangled fashion, unrealistic body images, and social machinations. Ptui. If you want your girls to value knowledge and abilities like they do store-bought items, get them The Double Daring Book for Girls. I truly believe it has the power to inspire and edify any child with a curious mind, while simultaneously countering media-induced materialism. 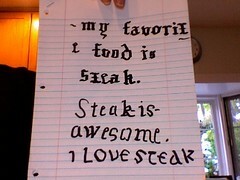 It is a treasure. If Iz or you, or anybody you know wants to learn how to waltz I recommend Friday Night Waltz (http://www.fridaynightwaltz.com/) They meet in Palo Alto and Oakland currently. The music is mostly contemporary pop/rock/metal that has the right beat for waltzing or polka or whatever. Dress is casual. It's probably the event I miss most since I left the bay.